Taken by the Eagles in the 2nd round of the 1985 NFL draft, Cunningham saw some action in place of veteran QB Ron Jaworski, and while he completed only 42 % of his passes, he showed off his exciting running ability. In ’86, under new Head Coach Buddy Ryan, he saw more action in place of Jaworski and took over as the starting quarterback during the strike-interrupted 1987 season. Cunningham threw for 2786 yards and 23 TDs in 12 games and also rushed for 505 yards. He followed up with a 1988 season in which he set a new club record with 3808 passing yards and rushed for 624 yards as the Eagles won the NFC East. 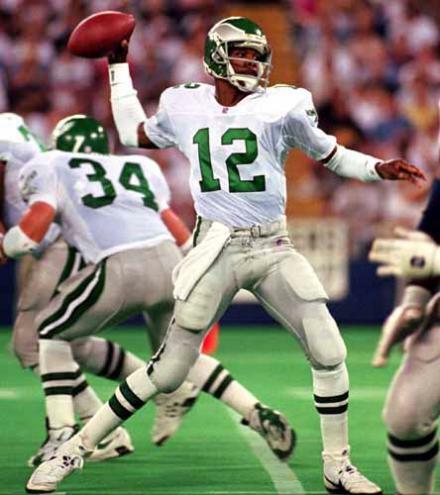 Cunningham had another Pro Bowl year in 1989, passing for 3400 yards and running for 621, but the Eagles again lost in the first round of the playoffs. An outstanding talent who could often improvise brilliantly, Cunningham was less adept at reading defenses and often irritated teammates with his demeanor. Eagles went 10-6 to finish second in the NFC East and qualify for the postseason as a Wild Card while leading the NFL in rushing (2556 yards) and the NFC in scoring (396 points) and touchdowns (48). Lost Wild Card playoff to Washington Redskins (20-6). Cunningham was lost to a season-ending injury in the first game of 1991 and, while he successfully returned in ’92, injuries became more of an issue as he missed most of 1993 with a broken leg. Benched in favor of Rodney Peete in ’95, he sat out a year in retirement before returning as a backup with the Vikings in 1997. When starting QB Brad Johnson was injured early in ’98, Cunningham put together an outstanding season, leading the league in passing (106.0 rating) while throwing 34 TD passes against just 10 interceptions. However, the team was upset by Atlanta in the NFC Championship game and Cunningham played in just six games in ’99. He finished up his career for good following a year each in Dallas and Baltimore. In the end, he passed for 29,979 yards and 207 TDs, was the career rushing leader for quarterbacks (4928 yards), and had the best rushing average (6.4) of any player in NFL history with over 750 carries (775).